PowerSchool is our student/family database. Parents can use this tool to view your students schedule, grades, emergency contacts, School Messenger alert settings and annual permissions for your student. The PowerSchool Parent Portal is open to parents to view and update their annual permissions through mid-September each year. After this time parents should call their school secretary to make changes to their phone numbers or emails. 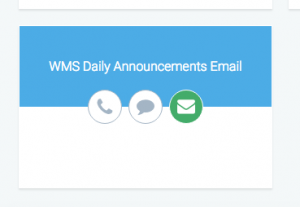 The SchoolMessenger InfoCenter is available in PowerSchool throughout the school year for updating your alert preferences for emails, text messages and phone calls. Click the “SchoolMessenger” icon in the left sidebar of the Power School Parent Portal. Below are links to the Parent Portal along with quick start guide and Frequently Asked Questions for PowerSchool. We request all parents update/confirm their student’s information each school year to be sure we have the latest information. If you do not have your Access ID and password yet, an email with your ID will be sent when the Parent Portal opens each year. Go to PowerSchool http://wellesley.powerschool.com/ and sign-in as you normally would to view schedules, etc. If you have not logged into SchoolMessenger recently you may be asked to re-confirm your phone and email. What if I’m not receiving messages even though I opted in? Most Common Problem – Wrong Phone Number on File in PowerSchool: Check with your building secretary that we have your mobile phone number on file correctly in PowerSchool. For high school students, please contact your House secretary. Purchase Blocking Set-Up on your Phone: If you have purchase restrictions set-up on your phone, you may not be able to send or receive messages via a shortcode like 67587. If you wish to adjust your purchase blocking settings, please contact your phone carrier (Verizon, AT&T, Sprint, T-Mobile, etc.). What types of messages will I receive via Text Message if I Opt-In? Text messages will be available for Emergencies and Urgent Alerts (such as severe weather closures). Text messages will also be available for High School Attendance alerts. Text messages will NOT be available for longer email communications, such as school newsletters. If I change my mind, can I opt-in or opt-out of Text Messaging at a later date? Yes, you can opt-in or opt-out at anytime. If I don’t Opt-In will I miss out of important communications? No, any district message sent by text message (such as a severe weather closure) will also be sent by an alternate method, such as phone call or email. 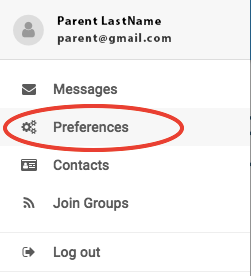 You may adjust your communication preferences in the Power School Parent Portal by clicking the “SchoolMessenger” icon in the left sidebar. What if I get a new cell phone number at a later date? You can update your cell phone by contacting the main office at your child’s school. For high school students, please contact their House secretary to change phone numbers. After adding a new cell phone, you will get an Opt-In confirmation text to your new phone the following day between 10:00am-9:00pm. You can send an email to powerschoolaccounts@wellesleyps.org.